Echinacea Purpurea or Echinacea Angustifolia: Which Echinacea is Best? Home DIY Natural Blog Health Echinacea Purpurea or Angustifolia: Which is Best? 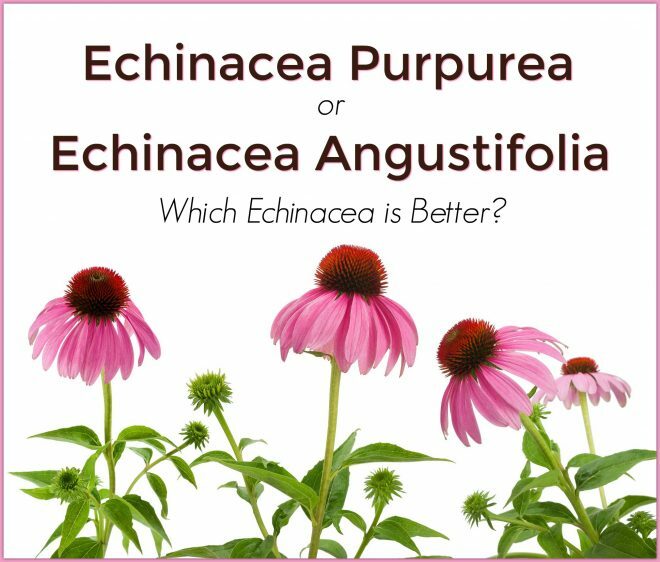 Echinacea Purpurea or Angustifolia: Which is Best? Echinacea is at once easy to find, in just about every seed catalog and garden center, and also in danger of losing native habitat. This prairie plant is one of the most recognizable herbs in the trade. Popularity has its price though, making the plant an easy target in meadows where it was quickly dug up to feed a growing supplement market. Today, organizations like United Plant Savers work to ensure that echinacea is maintained in natural spaces and grown sustainably by a growing list of suppliers. Their work helps ensure that the world has easy access to this wonderful plant. Did you know that there is a bit of controversy over which kind of echinacea you should use? You may have noticed that there are all kinds of new colors of echinacea in your seed catalog. You may have also noticed that there are at least two choices from your favorite herb supplier. What is the difference between species? There are two species that are easily found, Echinacea purpurea and Echinacea angustifolia. Both are native to various parts of the United States, but when we first learned about the use of this plant from the Native Americans they were just using Echinacea angustifolia. Because Echinacea purpurea was so abundant in Europe at the time of its introduction to the supplement trade, they began using it instead of Echinacea angustifolia. Many believe that Echinacea purpurea is inferior to Echinacea angustifolia and therefore less effective. Echinacea angustifolia is certainly more rare and many find it a bit more difficult to grow. The answer to the question of which one to use is basically up to interpretation; there are many herbalists who will line up on either side of the argument with strong evidence that both of them work. My research leads me to believe that at the very least, it may be necessary to use Echinacea purpurea in higher doses than we would have to use Echinacea angustifolia. Do I Use the Leaf or Root? In most herb catalogs you are likely to find both dried leaf and dried root of echinacea. Traditional use of the plant focused on root preparations, but we have come to understand that all parts of the plant contain the necessary chemicals to support our immune system. The best way to create a tincture of echinacea is to start early in the season with a leaf tincture, add the flower in the summer, and top off the preparation in the fall with a bit of root. Both echinacea species will shine in situations where the body is experiencing infection. The whole plant is very helpful for illnesses such as a sore throat with patches of pus, something like a strep throat. Echinacea is very useful for conditions that involve advanced infection or degeneration of tissues. It can be used where the system in general has been overtaxed with stress and overwork. The compounds within this plant marshal our white blood cells to move efficiently toward a place where our body is losing a battle with infection. This is the reason I don’t advise echinacea be used as a tonic, or preventative, for the immune system. If you decide to add echinacea to your teas or tinctures in preparation for the coming winter’s ills. Be sure to source them from a reputable herb seller, such as Mountain Rose Herbs, that is taking care to protect native populations. You may rest assured that whichever species you choose, and whichever part of the plant you want to use, you will reap the benefits in case of infection. Do you use echinacea? If so, which species do you prefer? I was thinking the same thing, Carol L. I’ve been battling a UTI since mid~Sept. and was recently hospitalized for 3 days with meds through an IV. My body’s been prone to UTI’s since I was born [long story short, dialysis for 7 years; kidney transplant 4 years ago and is doing great despite the UTIs], and is now immune to oral antibiotics. Recent lab work will tell if cleared. I would love to know what you meant. Thank you !! I was just getting ready to buy some, so good to know!!! Can you explain? This sentence doesn’t really let readers know WHY it shouldn’t be used for the immune system…at least, I can’t see the correlation. Thank you.